When a student leaves one class to attend another, use the Transfer link. Transferring an individual student from one class to another can be completed from the Class Enroll List tab or the Student's Summary or Schedule tab using the Transfer link. From the Class record choose the Enroll List tab. Locate the student who is transferring and click the Transfer link. In the Transfer Student window, set the Drop Date (defaults to current date). This is the date the student will be transferred out of the current class. Select a Drop Reason. Optionally add Notes. Locate the class the student is transferring into using the Search field. Enter an Enroll Date (defaults to the drop date in step 3). This is the date the student will be enrolled into the new class. 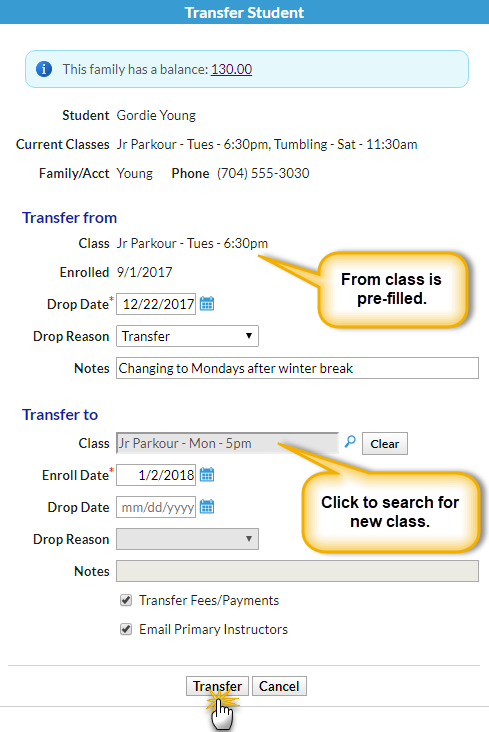 If you are aware the student will be dropping the new class on a specified date enter the Drop Date and select a Drop Reason. If the family has been charged and paid for the class the student is transferring out of and the fee/payment should be transferred to the class the student is transferring into, select the Transfer Fees/Payments checkbox. Choose to email the primary instructors the transfer details by selecting the Email Primary Instructors checkbox. Click the Transfer button to complete the transfer. On the Student record select the Tuition tab. Review rate(s) and edit as needed. Most Tuition Fees do not have a class associated with them. The exception is schools using Class Based Billing and Student Based Billing schools who edit individual transactions to list a Class. The option 'Transfer Charges/Payments' that displays in the Transfer Student popup only applies to transactions that list the class being transferred out of in the Class column. From the Student record, choose the Summary tab or the Schedules tab. Select the Transfer link next to the class the student will be transferring out of. Select the Tuition tab. Review rate(s) and edit as needed.